US Secretary of State Mike Pompeo has said it is “possible” that President Donald Trump was sent by God to save the Jewish people from Iran. The holiday, Purim, commemorates the rescue of the Jewish people by Queen Esther from the Persians, as the interviewer noted to Mr Pompeo. During Mr Pompeo’s tour of the Middle East, he came under fire for holding a conference call and only inviting “faith-based” members of the media to join. 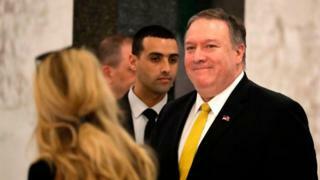 The remarks by Mr Pompeo, and the Golan announcement by Mr Trump, come just weeks before Israeli elections are held on 9 April.